Not only the big manufacturers show off new products at Computex 2012 event in Taipei. ViewSonic also show off its new product introduction. Introduced by Android Smart Display name or the name VCD22, tablet computer similar device but with 2x the screen size in general tablet, which is 22 inches. 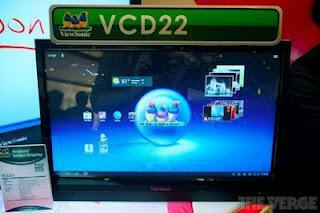 VCD22 is running Android 4.0 Ice Cream Sandwich, full HD 1080p resolution, 1 GB RAM and dual-core processor 1 GHz. With 22-inch screen, this device seems intended for residential use, family room or other education. VieSonic Android Smart Display is priced fairly cheap, only $ 479 . However, this tablet is said to have a deficiency in the contrast and viewing angle is not good.